'New York Times' Report: Trump's Tax Records Show He Could've Avoided Paying Taxes : The Two-Way Documents obtained and published by The New York Times suggest the presidential candidate's $916 million declared business losses in 1995 may have allowed him to legally avoid paying income taxes. Real estate magnate Donald Trump stands above the New York Stock Exchange after taking his flagship Trump Plaza Casino public in New York City. 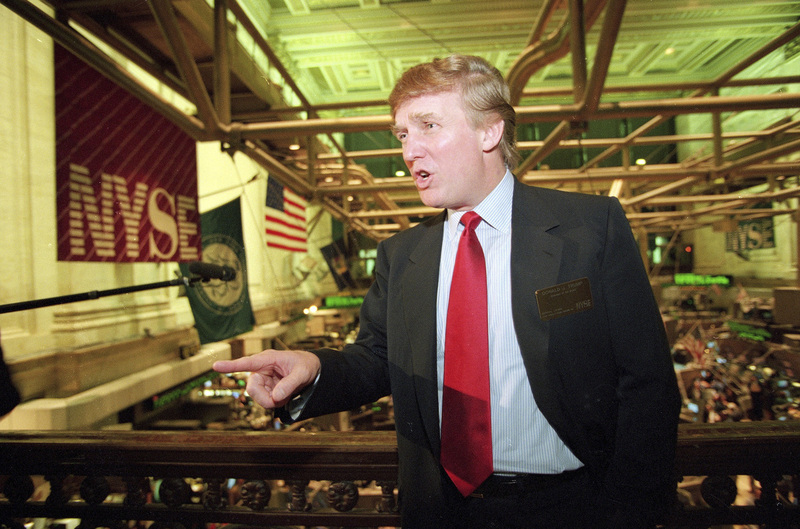 Trump's business losses in 1995 were so large that they could have allowed him to avoid paying federal income taxes for as many as 18 years, according to records obtained by The New York Times. Times reporter Susanne Craig, who's written about the Republican candidate's business ventures, received three pages of returns via mail from an anonymous source: "The first page of a New York State resident income tax return, the first page of a New Jersey nonresident tax return and the first page of a Connecticut nonresident tax return." The Times hired tax law experts to analyze the documents, which the outlet notes, are "a small fraction of the voluminous tax returns Mr. Trump would have filed in 1995." Those consultants determined that "tax rules especially advantageous to wealthy filers would have allowed Mr. Trump to use his $916 million loss to cancel out an equivalent amount of taxable income over an 18-year period." Under federal law at the time, a declared loss of that size could have allowed Trump to avoid federal taxes for as much as 18 years in a row, according to tax experts interviewed by the newspaper, "enough to wipe out more than $50 million a year in taxable income" over that stretch of time. The report suggests he may have benefited most from the "net operating loss" tax provision that, in short, allows for a range of business losses to be used to nix an "equivalent amount of taxable income from, say, book royalties or branding deals." The possibility of an 18-year-long tax avoidance is in line with IRS rules from 1995 that permit such net operating losses to be used to nullify taxable income earned in the three years before the net operating loss, in addition to the 15 years after the loss. In a statement released Saturday, the Trump campaign didn't dispute the Times' claims, but calls Trump a "highly-skilled businessman who has a fiduciary responsibility to his business, his family, and his employees to pay no more tax than legally required." It goes on to say that Trump has many hundreds of millions in property, sales, and local, state and federal taxes — without explicitly mentioning income taxes. After almost 14 hours of rare Twitter silence, Trump himself rang a similar tune in response to the Times report. Trump's income tax history is impossible to verify, because he's broken a decades-long tradition for major-party presidential nominees and refused to release his tax returns. He says he's being audited by the IRS, although there's no legal prohibition on releasing his taxes while under audit. Over the past several months, the Republican presidential candidate's finances have been subject to severe scrutiny, especially considering his penchant to tout his business record and wealth, albeit without talking specifics, nor much of a public record to go on. In Monday's debate, Democratic rival Hillary Clinton raised past records showing Trump did not pay income taxes in a couple of years in the late 1970s. Trump did not dispute that and responded by saying, quote, "that makes me smart." It's true that none of the report suggests any illegal activity on behalf of Trump. "The tax experts consulted by The Times said nothing in the 1995 documents suggested any wrongdoing by Mr. Trump, even if the extraordinary size of the loss he declared would have probably attracted extra scrutiny from I.R.S. examiners."